During our usual weekend grocery shopping, I bought a pack of blueberries which was on discount. This is not the first time I bought fresh blueberries, but it seems such a small pack now...especially compared to the 1 lb (more than 500g) pack we bought from Costco (a wholesale club) when we were in the States. Although blueberries have got very high antioxidant activity, we don't really enjoy eating them plain, unlike strawberries. So, I use them to make a fruit tart. 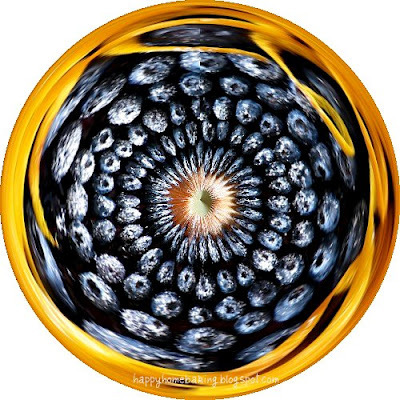 This photo was created using the dumpr site's 'amazing circle' effect. I was surprised that the orange peels which I placed in the centre of the tart has now been transformed into the circumference. How interesting! I followed a tart recipe which is quite similar to the peach tart I made previously. Although the original recipe is meant for a strawberry tart, I went ahead with it as I prefer frangipane fillings over a custard one. However, I was quite disappointed with the amount of fillings used...it was too little for me! I would have to double the portion for the fillings or follow the recipe under this Triple Almond Tart, the next time I make this. 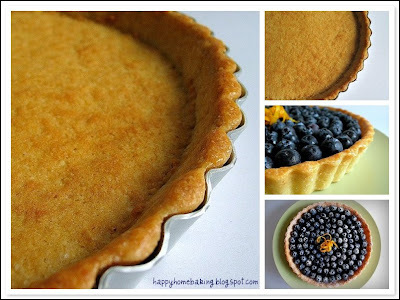 This tart proved to be a good way to get the kids to eat the blueberries fresh. The sweetness from the jam made up for the slight tangy taste of the berries. I love the pastry crust most. Lightly grease an 18cm tart pan, set aside. Toast almond powder at 100 degC for 10 mins. Stirring in between. Let cool. Sieve flour and almond powder, set aside. With a manual whisk, cream butter and sugar till light and fluffy. Dribble in the egg, whisk and mix well. Sieve over the flour/almond meal mixture in 2 to 3 additions into the batter. Fold the mixture gently with a spatula. Form and shape the pastry into a round ball. Roll out the pastry in between 2 sheets of cling wrap or baking paper (I used two sheets of cut-out plastic bags) to about 23cm in diameter. Remove one side of the cling wrap or baking paper. Place pastry over the prepared tart pan. Mould the pastry into the tart pan, smoothing the edges and the rim carefully...if the pastry is too soft to handle, chill it in the fridge for 10~15 mins. Use a fork to poke holes on the pastry surface. Brush the top of the rim with egg wash. Bake in pre-heated oven at 180 degC for 10~12 mins until the edges turned slightly browned. Let cool completely. 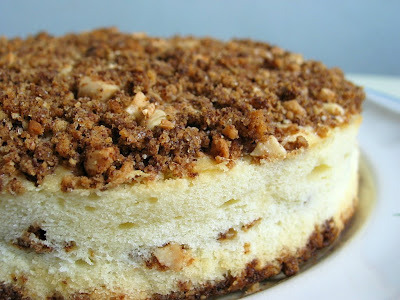 With a whisk, cream butter and brown sugar till the mixture turns fluffy. Add in the egg gradually, mix well each time the egg is added. Add in almond powder. Fold with a spatula till well incorporated. Sieve over the flour onto the mixture. Mix with a spatula. Add in rum (or vanilla extract) and mix well. Spread the filling onto the cooled pastry base. Ensure that the edges are filled up. Bake in pre-heated oven at 170 degC for 15~20 mins, until the edges and filling turn golden brown. Let cool. Spread a layer of blueberry jam on the tart surface. Arrange blueberries on top and dust lightly with icing sugar. Serve on the day it is made, keep in fridge if left overnite. Hey, i love yr peach tart recipe and have been using that crust for several pies! Just a question, do u chill the ball of dough before rollling? My experience with the dough is that it breaks so easily. I shall go out and get one pack of blueberries on my next grocery trip. I have tray yr ice-cream cake is very nice but I have a problem that it melt very fast less than 2mins it start melting.Can you advise what wrong is the ice-cream thta I buy? Hi Quizzine, I'm looking forward to read your post about it! Hi Beebee, glad to hear that you like the ice cream cake. I don't think it's the problem with the ice cream. I suspect you didnt chill the cake long enough. If you leave it overnite, it will not melt that quickly, but in our weather, it will sure melt after 5 mins. thanks for the advise.Were try again want to do for my sister birthday this coming Sunday but now is the problem how to send to her? If I can;t get any dry ice. Oh what a pretty looking tart! I'm inspired to make one now, since blueberry season is right around the corner. We live in Portland Oregon, and go blueberry picking every year (at a bluerry farm a few miles from our home). We also make it a point to pick extra to freeze (since it is usually only about $1 per pound) for making smoothies and for baking year round. The fresh blueberries you bought from Singapore must not have been ripe when picked because the ones we pick are very sweet, not tart at all. Wish I could bring you back some when we go back to Singapore end of Aug (since they travel well), but the season would probably be over by then. :( Thanks for sharing the recipe. Wow! All of your recipes look good! 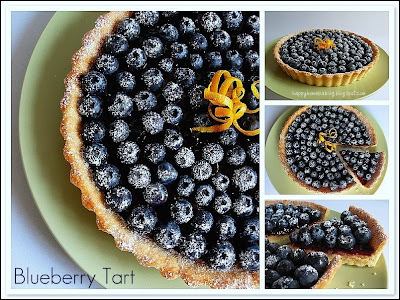 I might give this blueberry tart a try this week. I'll let you know how it turns out! Visit my blog when you get the chance. It doesn't have as much content as yours. I've just started! Thanks! When you say almond flour, do you mean ground almond? Hi Fay, I've not tried blueberry picking, it must be very fun! They are selling at about S$4 for 125g here! Hi Anonymous, yes, I am referring to ground almond. Looks like a great recipe. Must have taken forever to arrange all those blueberries like that! That blueberry tart looks really good! hi, just wanna ask where go you get your blueberries from because at cold storage is like 7 to 9 dollars just for 200 plus grams. Hi Nat, yes blueberries are expensive. I usually get blueberries from ntuc...when there's a promotion, it will be about $3 ~ 4 for a 150g pack. Thanks for sharing this recipe. I tried this over the weekend and the tart tastes really good! Will be baking more with other fruits!